^ 2.0 2.1 2.2 2.3 2.4 2.5 2.6 2.7 2.8 2.9 Bausani, Alessandro, ‘Abd-al-Bahā’ : Life and work, Encyclopædia Iranica, 1989, （原始内容存档于2008-12-04）. ^ 4.0 4.1 4.2 Muhammad Qazvini. `Abdu'l-Bahá Meeting with Two Prominent Iranians. 1949 [2007-09-05]. ^ 'Abdu'l-Baha's Commentary on The Islamic Tradition: "I Was a Hidden Treasure ...". Baha'i Studies Bulletin 3:4 (Dec. 1985), 4-35. [2009-12-20]. ^ Tablet of the Branch. Wilmette: Baha'i Publishing Trust. [5 July 2008]. ^ The Covenant of Bahá'u'lláh. US Bahá’í Publishing Trust. [5 July 2008]. ^ The World Order of Bahá'u'lláh. Baha'i Studies Bulletin 3:4 (Dec. 1985), 4–35. [20 December 2009]. ^ Abdul-Baha. Tablets of Abdul-Baha Abbas. ^ Esslemont 1980，第77页, quoting 'The Passing of `Abdu'l-Bahá", by Lady Blomfield and Shoghi Effendi, pp 11, 12. 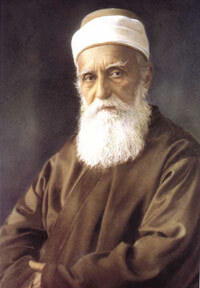 Kazemzadeh, Firuz, ‘Abdu’l-Bahá ‘Abbás (1844–1921), Bahá’í Encyclopedia Project, Evanston, IL: National Spiritual Assembly of the Bahá’ís of the United States, 2009. Smith, Peter, `Abdu'l-Bahá (PDF), A concise encyclopedia of the Bahá'í Faith, Oxford: Oneworld Publications, 2000, ISBN 1-85168-184-1, （原始内容 (PDF)存档于2011-01-01）. Ma'ani, Baharieh Rouhani. Leaves of the Twin Divine Trees. Oxford, UK: George Ronald. 2008. ISBN 0853985332. Speaks to Abdu'l-Baha's economics Mcglinn, Sen. Abdu’l-Baha’s British knighthood. Sen McGlinn's Blog. April 22, 2011 [2011-04-26].